So this year's map quiz -- a quick seven multiple choice questions, with maps! -- tests your knowledge of these creeks by another name. 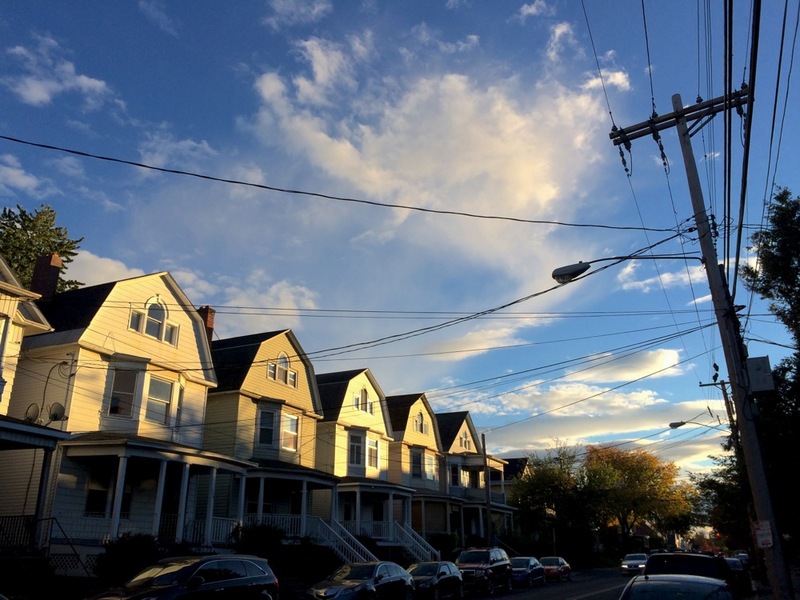 Maybe you saw that new list this week that ranked a ZIP code in Guilderland as the "best" neighborhood in Upstate New York for young adults. The ranking was the result of some crunching by Buffalo Business First of Census numbers related to population, education, employment, businesses, housing, and income. That link includes an explanation of the methodology. That a ZIP code in Guilderland would take the top spot in this sort of ranking raised some eyebrows. And we'd argue the list's methodology is basically a way of filtering for upper income people in their 20s and 30s. Also: "Best" for whom? People in their 20s and 30s are a huge, diverse population group. Using a word like best is probably an overreach. 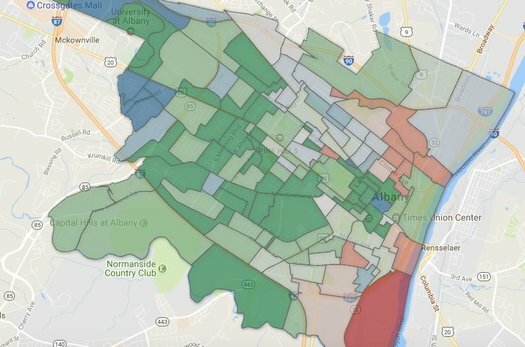 The Albany mayoral primary, one more time: Here's an up-close geographic breakdown of the voting in the Albany Democratic primary, which was won by Kathy Sheehan. As you know, it is the de facto election for the office because of the large Democratic enrollment in the city. Above is a clip from a map of individual election districts and unofficial vote counts (that now include absentee ballots). Are there clickable maps? You know there are clickable maps. A clip from the map we rolled use the new data. Knowing the location, condition, and allowable uses on a given trail is imperative for recreation planning by everyone from the casual or serious user to local and countywide planners. 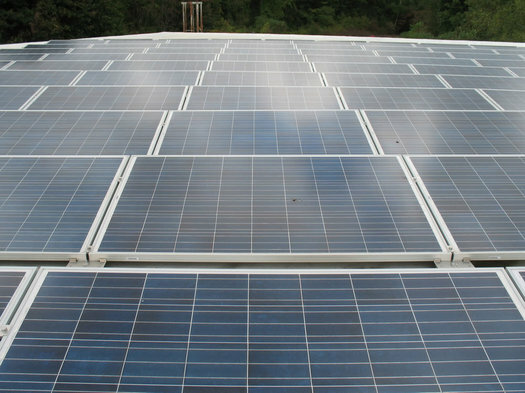 Saratoga county is known for its trail diversity, including the urban Saratoga Greenbelt Trail, the historic Champlain Canalway trail, the nature trails of Moreau Lake State Park, and the more local loops offering enjoyable outdoor experiences in Saratoga PLAN's Coldbrook and Ballston Creek Preserves. Eventually, as new trails are developed, such as at Corinth Reservoir Recreation area, Anchor Diamond Park, or around Lake Bonita in Moreau Lake State Park, they will be mapped and added to the countywide trails dataset. Saratoga PLAN has made the files available that geographic information systems can use as a sort of recipe to make maps of the trails. You can use an application like Google Earth to view them. Yep, it snowed a lot Tuesday during the blizzard. How much? Well, it varied a bit depending on location. What if Albany is upstate, but not "Upstate"? 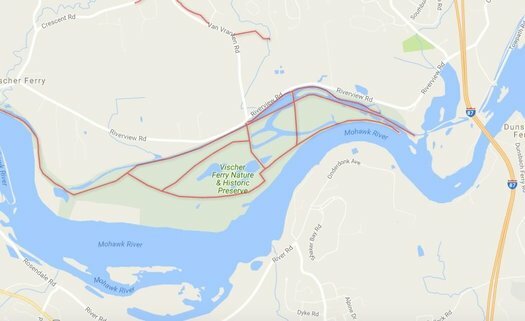 What are we really talking about when we use the term "Capital Region"? Is it a geographic place? A population of people? A set of economic connections? A culture? That's one of the questions we were thinking about while looking over a recent attempt by researchers to define megaregions and lay out a "functional economic geography of the United States." 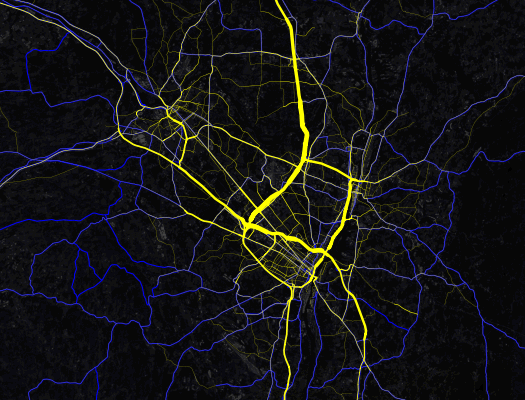 The work -- by Garrett Dash Nelson of Dartmouth and Alasdair Rae of the University of Sheffield (UK) -- takes a ton of Census data about commuting patterns and processes it into a series of maps. It's published in PLOS One. So, let's have a look at those maps for this area, along with a few thoughts about the results. 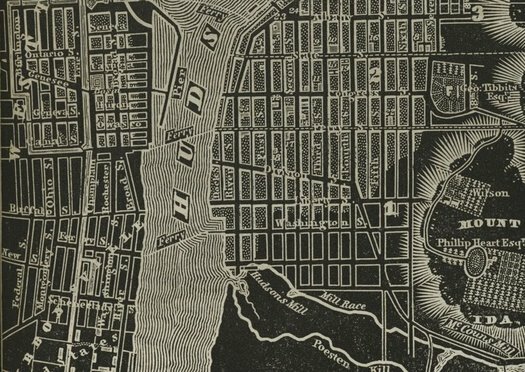 Check out this beautiful old atlas of New York State, originally published in 1838. It was the creation of the cartographer David H. Burr. And it's available online thanks to the digital collection of the New York Public Library. There's something about the high-contrast black-and-white color scheme and the way various features -- like the Hudson River -- are rendered that we really like. The atlas includes maps for counties around the states. But the parts that were most interesting to us were the old city maps. We pulled a few -- for Albany, Troy, and Hudson -- and there are after the jump in large format, along with a few quick notes. This is just a clip -- the clickable map is after the jump. As it says on the label, here is a clickable map of ZIP codes (roughly) in New York State. A while back we had planned to include this map with some discursive post about ZIPs and maps and perceptions of place that was related to the Halfmoon-wants-its-own-ZIP thing, but that post ended up only half baked and unpublished (thankfully -- no one needed to be subjected to that). We were reminded of the map again this week because of the wealthiest ZIP code ranking over at the Biz Review. Anyway (oh no, here we go...), ZIPs are kind of interesting because of what they started as (a way for the US Postal Service to arrange its routes) and what they've ended up being used for (a way for the rest of us to also identify places). As the ZIP data website ZIP Boundary highlights, a ZIP code doesn't really define an area for the USPS, but rather a collection of delivery points. And then there are the issues related to the fact that ZIPs are only loosely associated with municipalities -- that's how a place like Crossgates, which is in the town of Guilderland, ends up with a postal address that is Albany (because it's in the 12203 ZIP). Here's an interesting history of ZIPs, again from ZIP Boundary, that touches on that issue. 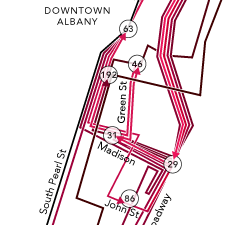 One of the things that's reinforced for us by looking around the map of Capital Region ZIPs is that the codes aren't necessarily a good way of defining areas (well, unless you're delivering mail). 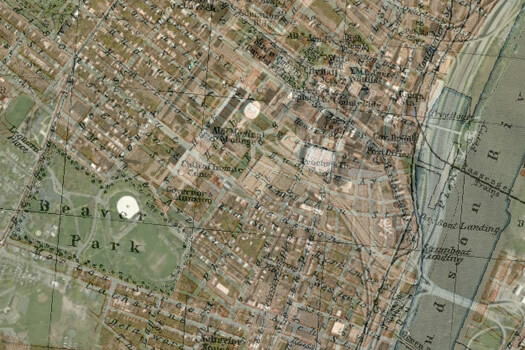 Again, using the 12203 ZIP as an example: it stretches from Washington Park in Albany west along Western Avenue, with lobes that include Guilderland, Bethlehem, and New Scotland -- that's an odd collection to group together. 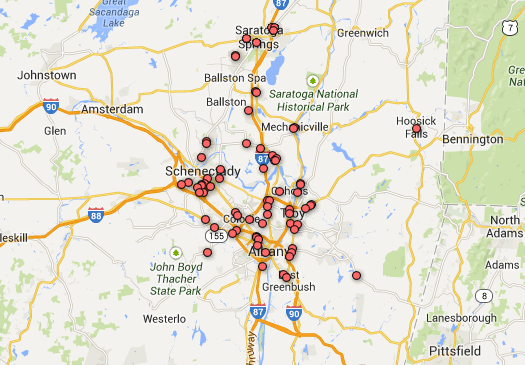 Map gawking: Check out this map of traffic volumes on major roads around the Capital Region. It's like an angiogram of the area's vehicle arteries. The map is a clip from a national map created by Mapbox using data from the federal Highway Performance Monitoring System and OpenStreetMap. Here's a zoomable version over at the Mapbox site. The data is limited to roadways, marked in yellow, that are eligible for federal aid. The wider the yellow line, the higher the daily average volume. 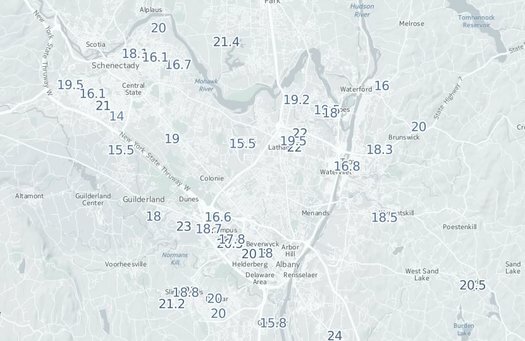 The relative volumes probably won't be much of a surprise -- you know, it's not unexpected that I-90 through Albany and I-87 from Albany north to Saratoga County are the most-traveled arteries (each averages more than 100,000 vehicles per day). 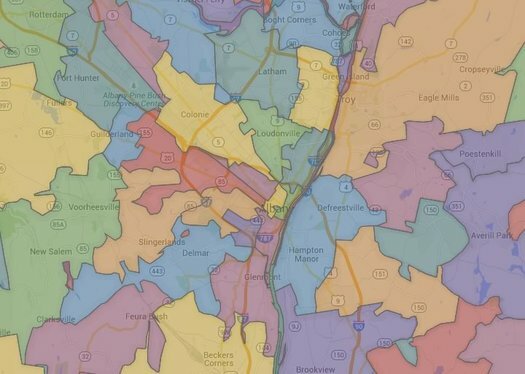 But one thing that did strike us about the map is the way it highlights the degree to which the Capital Region sprawls northward much more than any other direction. We've always been a little curious why areas such as, say, southern Rensselaer County and southern Albany County haven't been built up like southern Saratoga County. This is total historical/map nerd candy: The 1936 Atlas of the Historical Geography of the United States is now online in an interactive version, courtesy of the Digital Scholarship Lab at the University of Richmond. 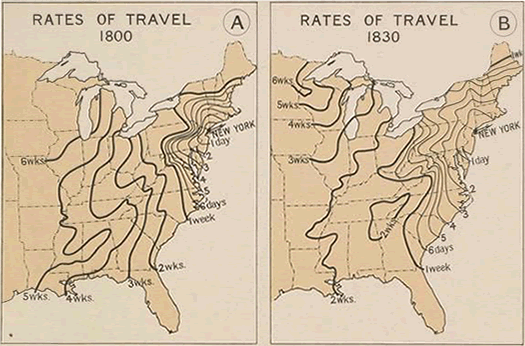 In 1800 travel by stagecoach was limited to the area bounded by Boston, Bennington, and Albany on the north, Richmond on the south, and the Allegheny Mountains to the west. It required 10 days of sailing to travel from New York City to Charleston and a minimum of 26 to 28 days to reach New Orleans. Buffalo was a 9-day journey via the Hudson-Mohawk route, and the trip over the mountains to Pittsburgh required 10 days. It required 22-25 days to reach Louisville by way of the Ohio and 28-30 days to reach Cairo. In Tennessee and Kentucky travel on horseback was more rapid than water transportation, because of the circuitous courses of the rivers, and several well-defined overland routes such as the Natchez Trail had already developed. The period between 1800 and 1830 was one of rapid development of water transportation and extension of highways. It marked both the development of the steamboat as a means of transportation and the completion of the Erie Canal. The traveling time from New York to Charleston was reduced to 6 days and to New Orleans to 14 days. To Cleveland was a 10-day and to Detroit a 13-day journey. From Detroit to Chicago was a 6-day trip overland, the much longer trip by water requiring about two weeks. 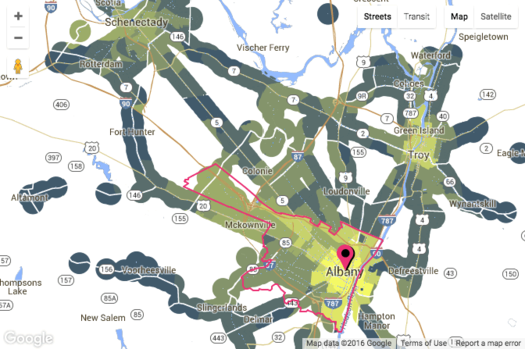 The atlas and website are filled with interesting bits, many of which include Albany and New York State in some way. Among them: Public Post Roads and Stage Routes 1774; and the De Laet Map of 1630, depicting Nieuw Neder Land and Fort Orange. The whole thing is definitely worth a look. For a Friday afternoon, another map quiz. Here's a larger, zoomable, clickable version, if that helps. We pulled the unofficial vote tallies on the casino amendment and mapped the results by county. Two clickable maps are after the jump. 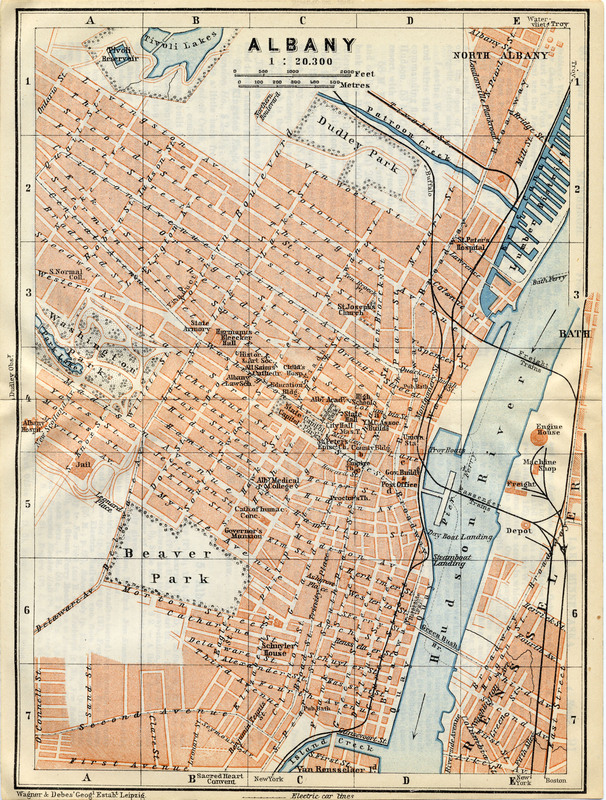 Because we're always interested in an old map... B sent along this superimposed map of Albany he created -- it's a 1910 map laid on top of a current map. He says in an email: "Found this 1910 map that snapped in pretty well. A lot of interesting stuff here, especially the blocks that became the Plaza and the Erie Canal before it became Erie Blvd." A large-format image of the map is after the jump. + As B mentions, it's remarkable how the ESP interrupted the flow of streets from the Lark/Washington Park area toward the riverfront. 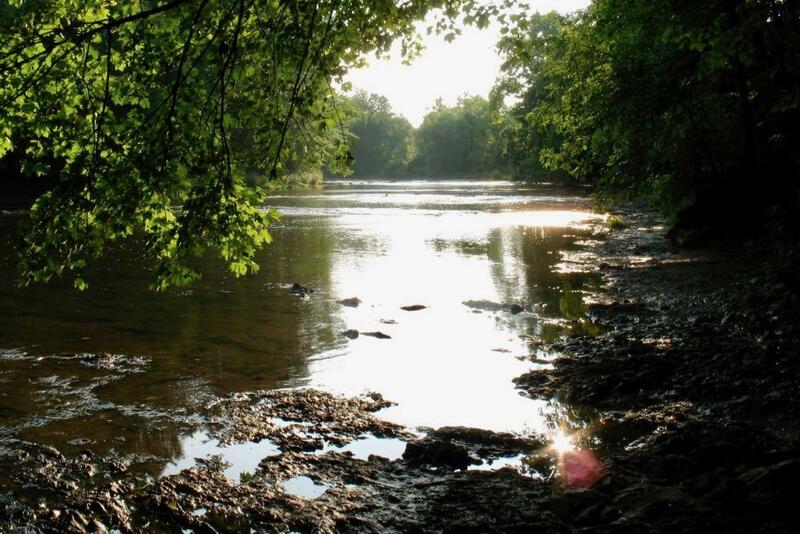 + And, hey, there was once a park on the north side of Arbor Hill, up against the Patroon Creek. This looks like it's the original 1910 map. 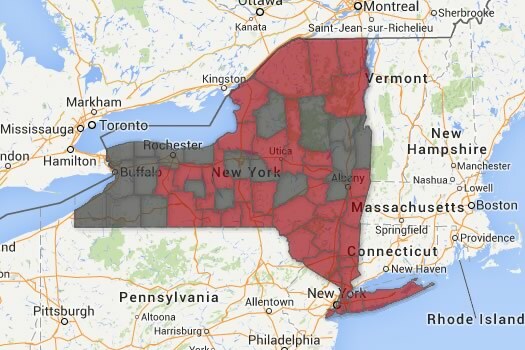 Can you guess what's responsible for the pattern in the Capital Region map above? Quick map puzzle: Can you name the pattern depicted in the map above? The answer is after the jump, along with a zoomable/clickable map. 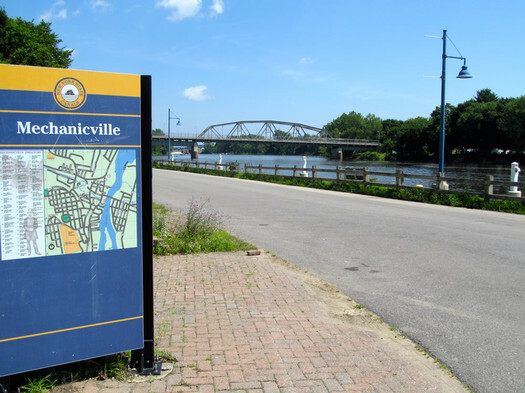 From the Annals of Facts of Limited Utility: While editing last week's in-between places feature about Mechanicville and Stillwater, we did some research on the claim that Mechanicville in the smallest city in the state. And based on Census data about geographic size, it's true -- M'ville's land area is just .84 square miles, more than half a square mile smaller than the next city on the list. Anyway, that got us curious about the size of cities around the state -- which are the biggest, the smallest, how big or small they are relative to each other. 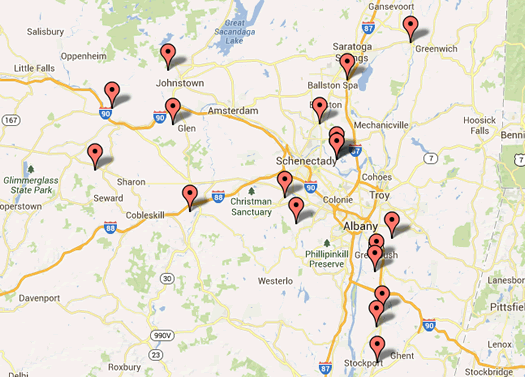 Today's map: The breweries, wineries, and distilleries of New York State. We created this map based on data recently posted by the state. It includes big breweries and distillers, but also microbreweries, farm wineries, and cider producers. Check it out in large format -- where there's also a legend for the map. We kind of feel sorry for the "bark" regions of the state. 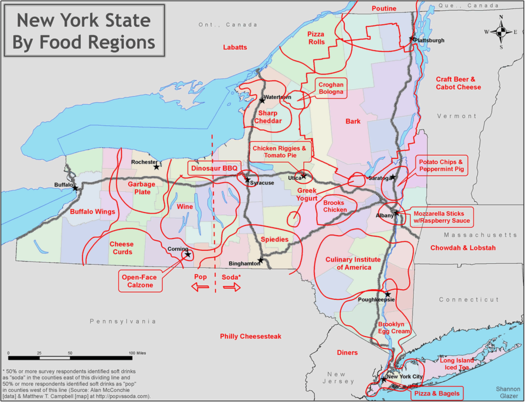 Check out this food map of New York State created by Shannon Glazer. She's divided the state into regions based on the foods for which they're known. For example: Utica and chicken riggies. She also marks the ever-important pop/soda demarcation. Here's a large-format version of the map. Shannon's started a Twitter feed related to the map: @NYS_food_map. Earlier on AOA: Martin on candidates for the quintessential Capital Region food.